The way we travel has changed drastically; modern travel is a world away from travel of the past. One of the most significant elements in this transformation has been the advent of wifi. While some may debate whether the internet is a blessing or a curse, when it comes to travel, it certainly has its uses. World-wide wifi access has not only made travel far easier and more accessible, but more enjoyable, too. From finding the best knot to attach your surfboard to the car, to one-pot camping recipes, to discovering the best places to visit in New Zealand, any information you could need on the road is now available at the tap of your fingers. Discover some of the ways a wifi connection can enhance your New Zealand travel experience. One of the central ways wifi can improve trips is the plethora of travel apps built to solve all your travel where, whens and hows. For New Zealand travel, perhaps the most significant of these are navigation apps, like Google Maps. The days of hauling huge and impossible-to-fold maps or constantly stopping to ask for directions are long gone. Nowadays, you can find your way – even in the most remote of locations – with a clever little travel app on your phone. But it doesn’t end at navigation. With the huge array of travel apps on offer, you can book last-minute flights, find the nearest hotels and search out where to park – all in one painless swipe. 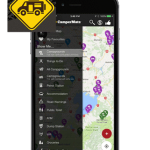 Top tip: Transforming New Zealand travel, CamperMate is a free travel app that enables travellers to find the nearest campsites, rubbish bins, toilets and more, all over Aotearoa. On the road no longer means out of touch. With the ingenious invention of the web, we can now stream movies on Netflix, listen to music and stay up-to-date with the news wherever we go. (And we all know epic New Zealand travel deserves an epic soundtrack). The ability to stream while you’re on the move also provides opportunities to connect with other travellers. We’re fortunate in New Zealand to be surrounded by a vibrant array of natural wonders. From the most splendid waterfalls, to where to catch the best surf, our helpful friend the internet allows us to hunt down the top spots in any location our New Zealand travel takes us. What’s more, by reading blogs or watching videos, we can get recommendations from locals and other visitors who have already done the groundwork. 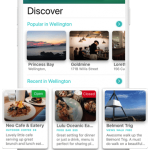 Top Tip: To discover some of the best places to visit in New Zealand, check out Breadcrumbs, an app that shares insights and hidden gems from locals and travellers with similar tastes. Who hasn’t received a tearful phone call from a family member complaining about the lack of communication? Luckily, we can now comfort our loved-ones not merely with a message or an email, but with our actual beaming faces (set against a beautiful backdrop). Entirely different from the pre-wifi hunts for internet cafes or desperate searches for bars of signal to let everyone know you’re alive and kicking. The internet has also provided a whole range of different ways to stay in contact. From group chats with the whole family, to social media updates, to lengthy blog posts, it’s now easier than ever to stay connected to family and friends whilst on the road. The rise of reviews has certainly changed the way we travel. Warts-and-all-reviews from other travellers, paired with candid photos and detailed commentary, let visitors know where to definitely visit (and where to definitely avoid). We all know that good food is an important part of any trip. Nowadays, rather than being left to your own devices, you can utilise thousands of reviews to make a decision about where to eat dinner. The same goes for where to rest your head. No more substandard meals or dodgy hotels. Find the best there is, anywhere you go. We’ll keep you connected, wherever you are. Check out our Wireless Broadband or NZMCA member packages to make the most of your New Zealand travel.